The Archive of Our Own is thrilled to announce that it is now home to 3 million fanworks! This amazing accomplishment could not have happened without the support and engagement of you, our incredible users. And now, less than a year and a half after reaching 2 million fanworks, we’re celebrating 3 million! The past decade has been an incredible journey, and the AO3 has grown more than we ever could have hoped back when it first started. It’s the people who make the Archive of Our Own what it is. Our more than 1 million registered users–and countless unregistered users–are some of the most enthusiastic and passionate folks around, giving so much of themselves in the works, comments, and kudos that they share. So we want to hear your stories. What does AO3 mean to you? You can share your answer in a word. You can share it in an essay. In a drawing. A song. However you want to celebrate your experience, we want to know about it. 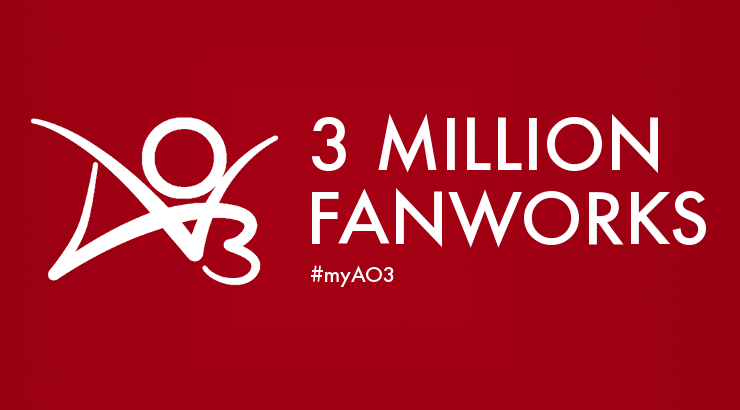 Leave a comment or use the hashtag #myAO3 on social media so we can hear what you have to say. Three million thank yous to everyone who helped the Archive get to where it is today! AO3 has changed my life to the better. I wrote lot of story, and read even more. I learn english, and all that bring me joy. Thank you all. I think AO3 is the best fanfic site out there, and I love having the place to put all my ideas. To me AO3 means hours of fun reading in my favorite fandoms. Gone are the days where I had to search through the web to find fanfiction. I started on AO3 in 2014, and have loved it ever since. The stories and authors have made me laugh, cry, shout, and feel peace. I have grown into so many universes and dimensions. It’s a beautiful multi-faceted place. It’s great, being a fanfic creator, knowing there’s a place where it’s easy to post and organize your works, easy for others to find it, and where someone’s got your back. AO3 gave me the courage to finally start writing and share the worlds in my head with a community. It was liberating and educative in a way I had never imagined anything could be. I’ve never been a reader, much less a writer. I am on AO3 constantly. Some folks are addicted to video games, I am addicted to AO3. It relaxes me, plus, I’ve decided to take a chance and write a small story because of it. Ao3 means everything to me. Everything. This Post is Made Possible by Donors Like You!